September 2017 Best Buys at Pine Lake Mountain Cabins and Land! Visit our Pine Lake Community Facebook page for the latest! Pine Lake Homes for Sale – Best Deals! The best buy is this property listed for $175,000. Get out of the heat & enjoy the serenity of nature. Just off Hualapai Mtn Rd, on Knob Hill Drive, listed 02 bedrooms, 2 baths. Wrap around decking on 3 sides. Rear kitchen has pergo floors and granite counter tops and breakfast bar. Adjacent dining and Living room areas. Wood burning fireplace and full bath down stairs. 2 BRs upstairs with a partial bath. Wood burning fireplace. New high efficiency AC/Heater unit. Tuck under 2 car garage. Registered Well #55-516870 Seller looking for offers! More info. The next best buy is this home on Spruce Lane, listed for $325,000. Beautiful mountain living, pine trees, deer and elk at your doorstep! Wonderful custom home, spacious open living room with gas free standing fireplace, huge windows to enjoy the views, french doors to deck with jacuzzi. Large chef style kitchen with breakfast bar, custom maple cabinets, stone counter tops. Wet bar with sink and mini refrigerator. Second bedroom has tongue and groove walls, large walk-in closet and full bath, master bedroom has intimate soaking tub, separate shower, dual vanities. Huge work out room with vaulted ceilings and closet, and could be large 4th bedroom. Nice front deck "trex decking". 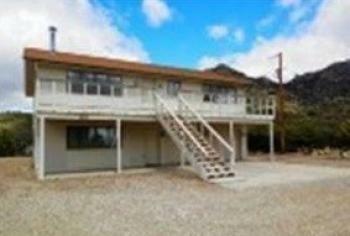 2 car carport in front of garage, plenty of room for RV or boat parking. This is a MUST SEE home! More information. The last Pine Lakes best buy this month is on Knob Hill Drive and listed for $329,000. The mountains is where it is at for living and relaxing. 3/2/2, 2 story beautiful home and extremely nice custom built home designed with an open floor plan. 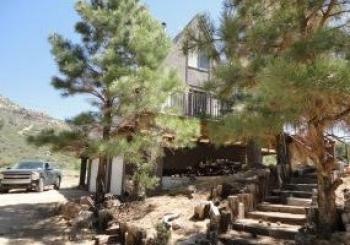 Remodeled Mtn Cabin 2 Story Pine Lakes Kingman AZ! This home has recently been remodeled with a heated garage, a laundry room, and a garden areas completely enclosed. Also includes a water softener, and 2 heating units. 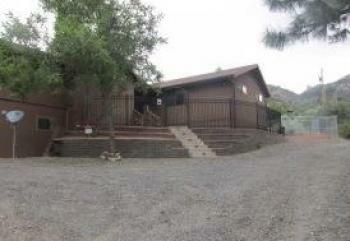 This property is very private and is at the end of the road next to BLM Land. Wow! Love that walking distance to the lodge. More info. 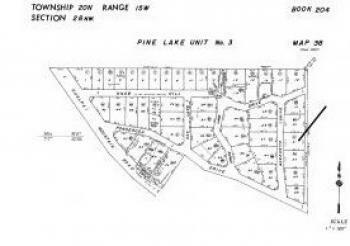 Pine Lake Land for Sale – Best Deals! The best land buy this month is 2.02 acres on Silk Tassel Lane, listed at $149,000. 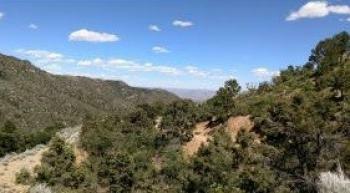 Rare large 2.02 acre lot in Pine Lake in the Hualapai Mountains! Rare 2 Acres Pine Lakes Kingman AZ Cool Summers! This beautiful piece of property borders BLM land. No neighbors close by. This lot has a large graded pad, drilled water well, underground conduit for electricity and phone line. The lot is ready to build on. Just minutes from the Hualapai Mt. Lodge and about 15 minutes from Kingman. Elevation is about 6500 ft. If you are looking for a great place to build that getaway cabin or a home out of the heat-- this is it. Cooler temperatures in the summer or enjoy a little snow in the winter. This is a must see lot! More information. The last best land buy this month is listed at $30,000 on Manzanita. Vacant lot, on sunny side of mountain. Privacy, views, cool temperatures, Nature, and all types of wildlife in the area. Additional Information: Pine Lake Unit #3. Other Nearby Neighborhoods: A Guide to More Information. The cabins here are all site-built, single family dwellings. Lot sizes vary from fairly small to over an acre and cannot be split. The terrain is steep and mountainous. Residents frequently spot beat, elk, mule deer, mountain lion, and javelina. Most properties have wells here! These parcels afford privacy, access to miles of hiking, ATV and horse trails, a mild year-round climate and incredible views. Pine Lake is nearby as is the Pine Lake Lodge. Pine Lake is a great vacation community for cool get-aways during the sunny Arizona summer!